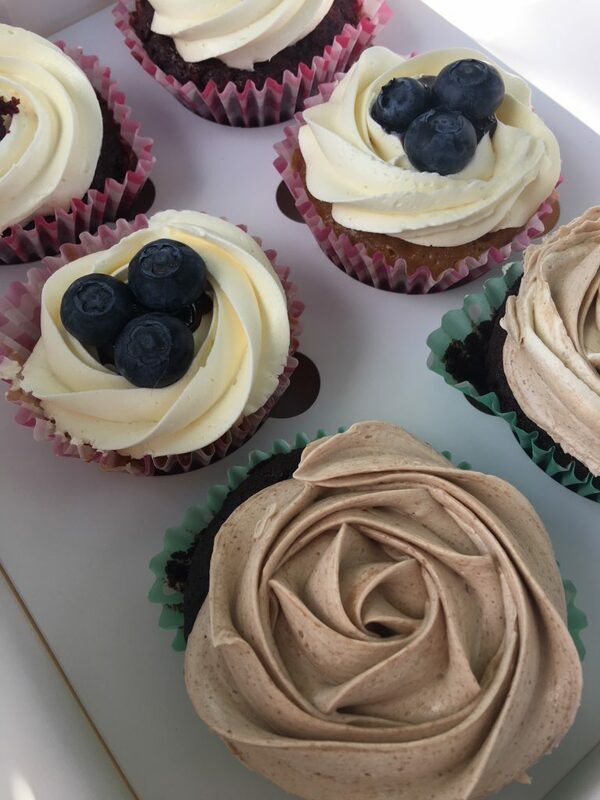 Finally managed to get along to the Bunbury Markets this Saturday morning to sample some gluten free and vegan cup cakes from Devil’s Decadence. Lucky I did not go much later as these sweet cup cakes and slices sell out fast. I chose a selection of red velvet, blueberry and nutella flavour cup cakes. They were delicious with my takeaway coffee, nice dense texture, not too dry or moist, but lets face it the best bit of cup cakes is the frosting and I was not disappointed. I can definitely suggest checking them out at the Bunbury Markets the 1st Saturday of the month or at the various other locations and markets. 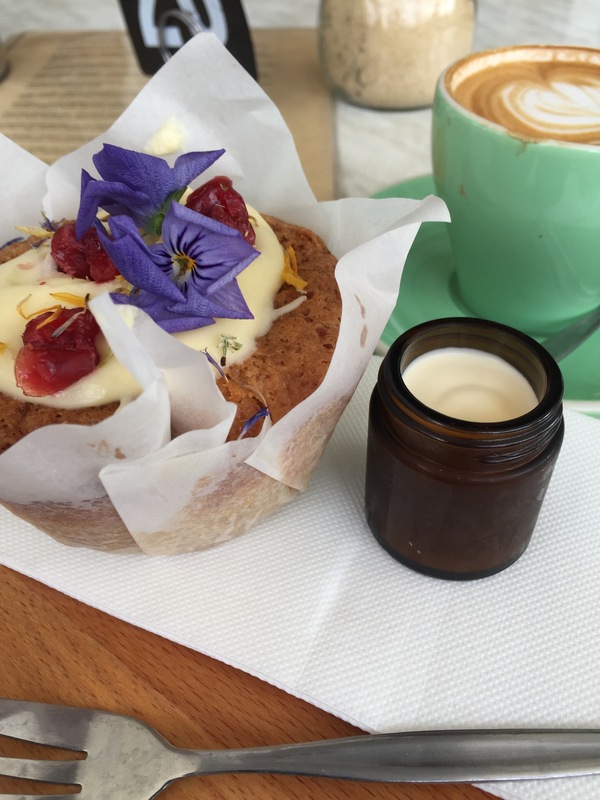 Devil’s Decadence also supply cup cakes to Bayside Barista in Safety Bay which is WA’s first Coeliac Society accredited cafe and everything is gluten free. I had the chance to have breakfast there a couple of weeks ago while on a yoga retreat and they did not disappoint. The popover bread is the best and was almost croissant like in its fluffiness with my scrambled eggs. Next time will get a photo but was too eager to eat on my first visit! Worth a trip to Safety Bay if you are driving by and can stop in a visit Penguin Island while you are there. 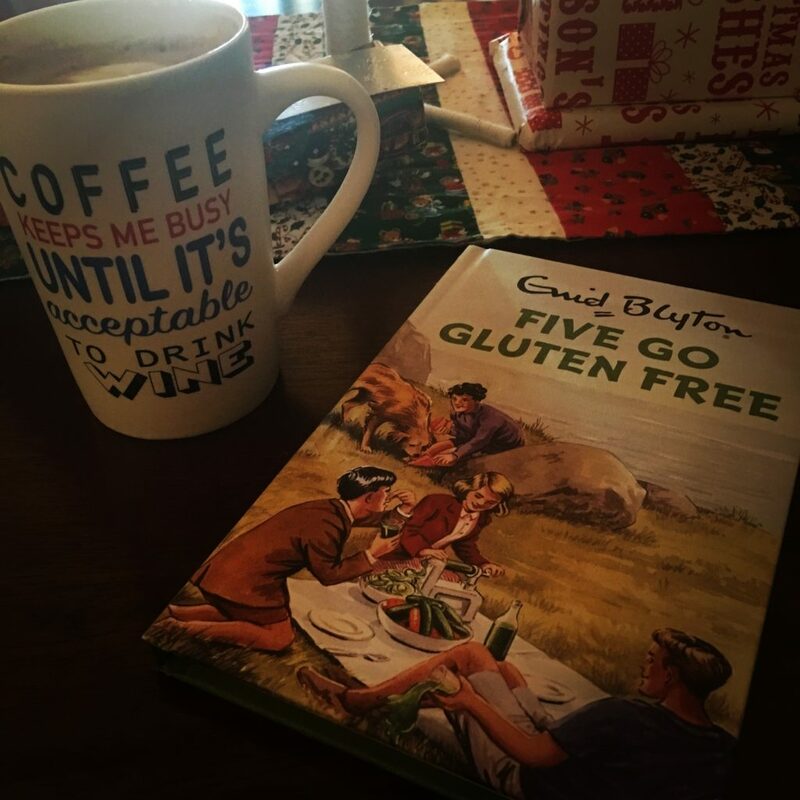 I have been in my new job just over two months and I think my colleagues know me too well as my manager gave me a hilarious book “Five Go Gluten Free” by Enid Blyton, well not really! It is Enid Blyton for grown ups. There are also Ladybird books for grown ups on cats, mindfulness and the zombie apocalypse – maybe need these as well. Thankfully coffee and wine are gluten free so that is my Christmas sorted! But seriously being Coeliac at Christmas time can be a hassle with the eating out and hidden gluten in all sorts of things so be prepared. I wish everyone a safe and peaceful holiday break – take some time to slow down and appreciate good food and company. My New Year resolution is to do more blog posts! Checked out the new outdoor area and the summer menu. The Bliss Bowl and Paleo Bowl are both gluten free. 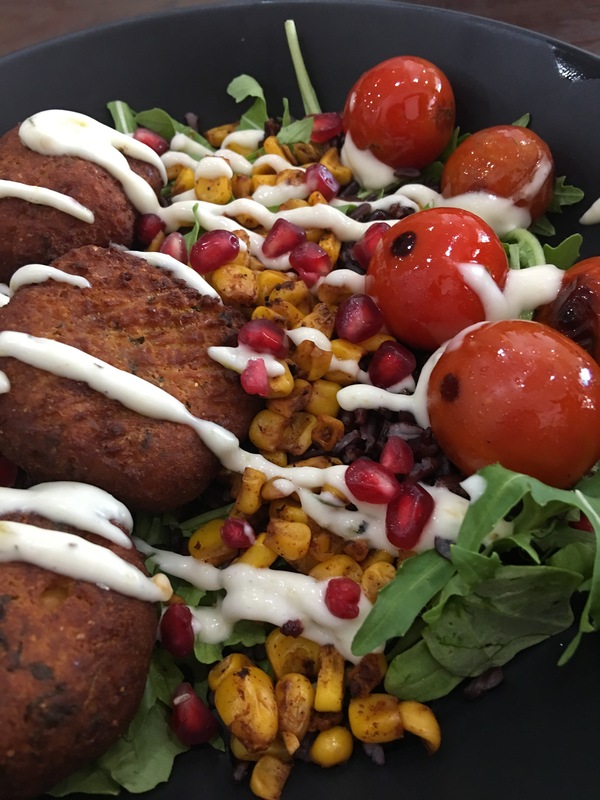 I had the Bliss Bowl with sweet potato falafels, smokey corn, cherry tomatoes on wild rice salad with jalapeño ranch dressing and pomegranate gems. On the brekky menu the Tropical Chia Pudding is gluten free and looks delish for summer. The Townhouse also offer gluten free bread and I have had this with the Smashed Avocado and can still afford my mortgage repayments! 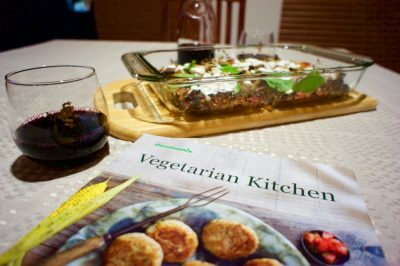 Thermomix has released a new cookbook “Vegetarian Kitchen” which also includes lots of gluten free options, after all vegetables are gluten free! The cookbook is suitable for both the TM5 and TM31. 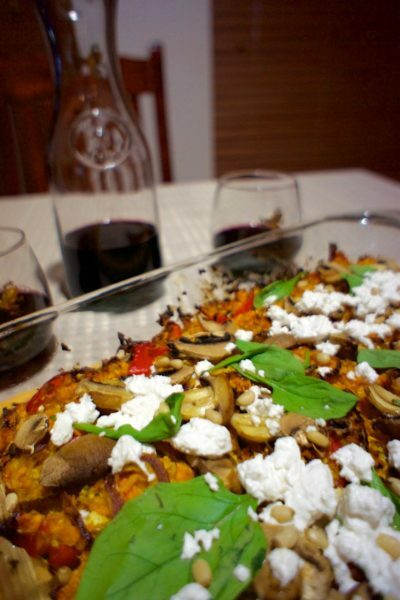 The pictures are beautiful with a range of recipes with colourful vegetables. I chose to trial the Vegetable Bake with Goats Feta which is actually in the breakfast section and can be served with poached eggs. I made it as a vegetable side dish for dinner and it was delicious with the lemon chilli dressing. It is listed as a Nut Free recipe but it is also Gluten Free as long as use pure gluten free cornflour. Some of the recipes such as the Mexican Stack can easily be converted to gluten free by using gluten free corn tortillas instead of Lebanese flat bread. Happy New Year and apologies once again for the lack of posts! 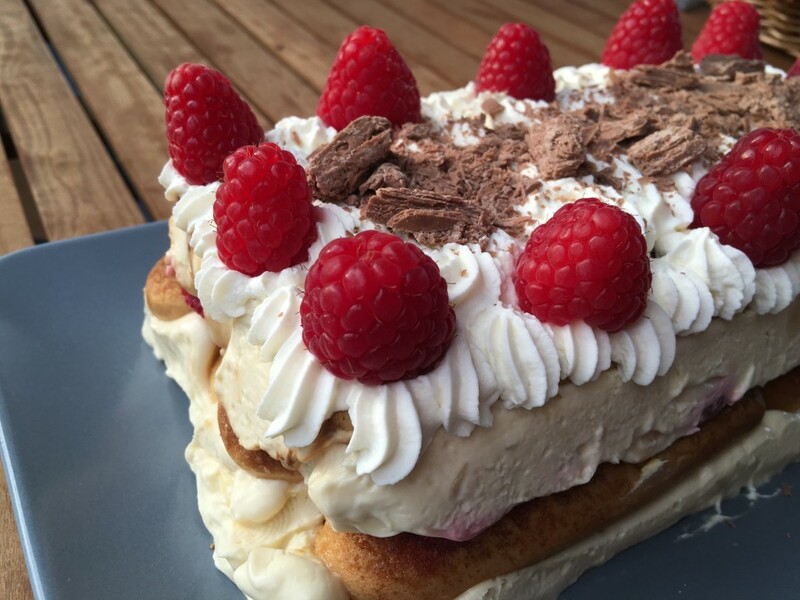 I made this gluten free version of a Tiramisu twice over the holiday period as I loved it so much. You can use different fruit like strawberries as well. Beat together the cream cheese, cream and sugar until smooth. Fold in the vanilla and almonds. Dip the sponge fingers into the coffee/Kahlua quickly on each side. Place a layer into the base of a baking paper lined 21cm x 10cm bar tin. Top biscuits with half of strawberries and 1/2 of cream cheese mixture. Repeat the layering process twice again finishing with layer of biscuits. To serve turn out onto a plate and decorate with extra piped cream, raspberries and crushed Flake. So it has been a while since I have done a blog post! Recently have been frequenting Benesse Cafe and very impressed with their home baked gluten free bread. 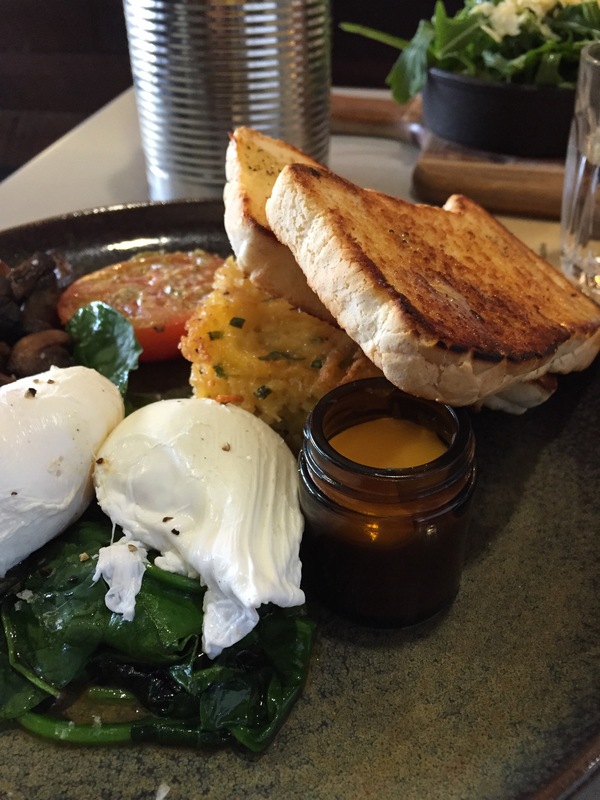 It was delicious toasted to accompany the vegetarian breakfast compete with potato cake. We also visited for afternoon tea and I had the almond and polenta cake. It was a bit dry but OK with the frosting. There is a range of different gluten free options including some raw treats. Once again another busy year and I apologise for the lack of posts lately for recipes, food or places to eat! I hope you have all had Happy Gluten Free Christmas! I have some time off work so had a go at baking my own gluten free gingerbread cookies for Christmas. I followed a recipe I found on the Food Daily website and you can find the details at the link here. I used my Thermomix on speed 4 to mix the wet ingredients and then use the dough cycle to add the dry ingredients. My first batch of cookies I did as gingerbread people but as they were rolled quite thin the cookies were a little hard, tasted delicious with icing, but hard on the teeth. The next batch I made more like a melting moment biscuit rolling balls of cookie dough and pressing flat with a fork. 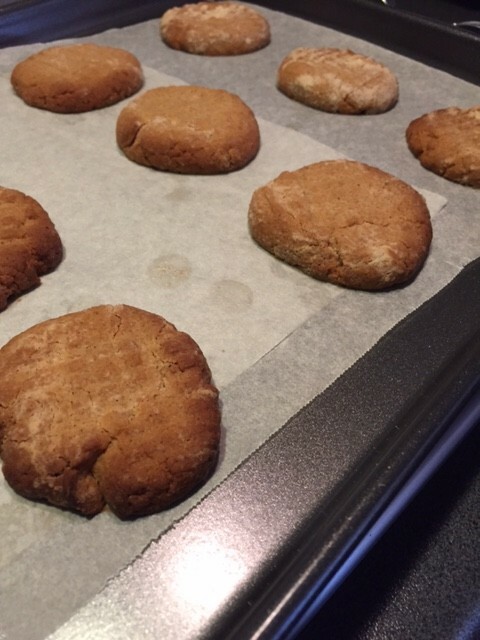 Plan to add some ginger buttercream icing to these cookies. 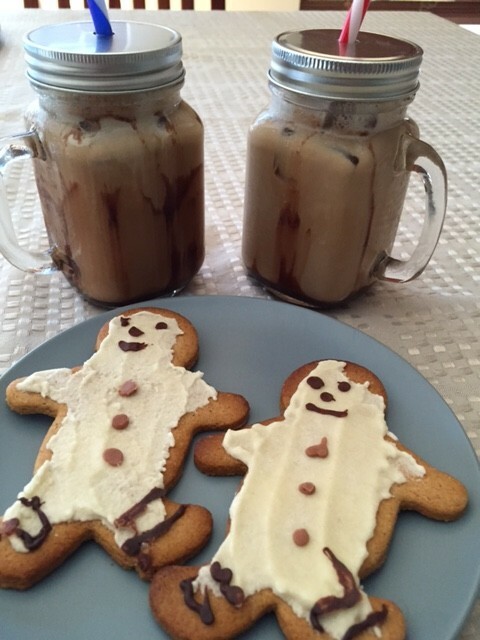 Cookies taste best with a iced mocha served in my new favourite mason jar glasses! 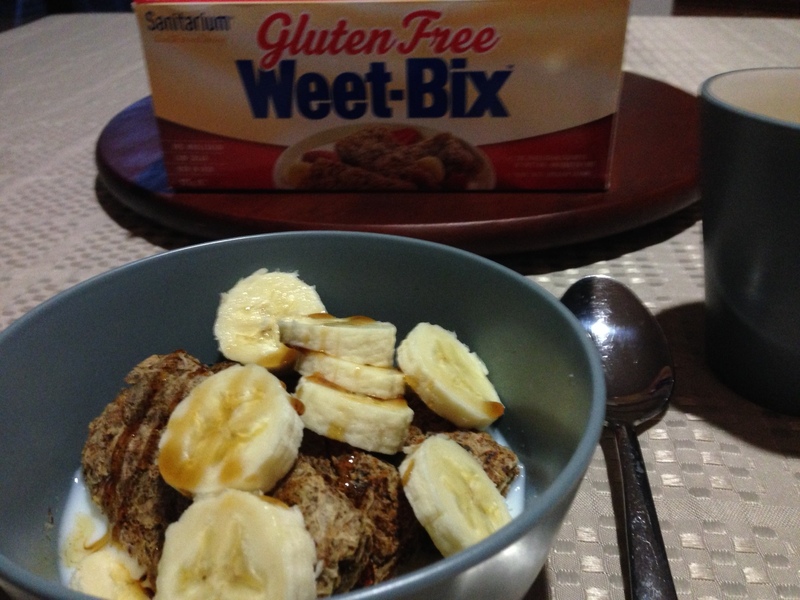 When I first saw a post on Facebook for gluten free Weetbix I thought it was a hoax! Before being diagnosed Weetbix was one product that would make me feel very unwell and give me indigestion, for obvious reasons! So it was with some mixed feelings that bought a packet to try. Well I am hooked. I love them for a quick, easy breakfast with some chopped banana and greek yoghurt. They are also considerably cheaper than other gluten free cereals. Sanitarium’s website says they are made with sorghum and in a dedicated gluten free factory. Check out the details here and they are available from Coles, on special they were $3.99 for a 375g box. The website also says Coles will release a second mystery gluten free product on 1st September so watch this space! At the airport on way back from Melbourne I spotted a new gluten free magazine Gluten Free Life, check out the website here. Issue one is available now and features a delectable Red Velvet Cake on the cover. 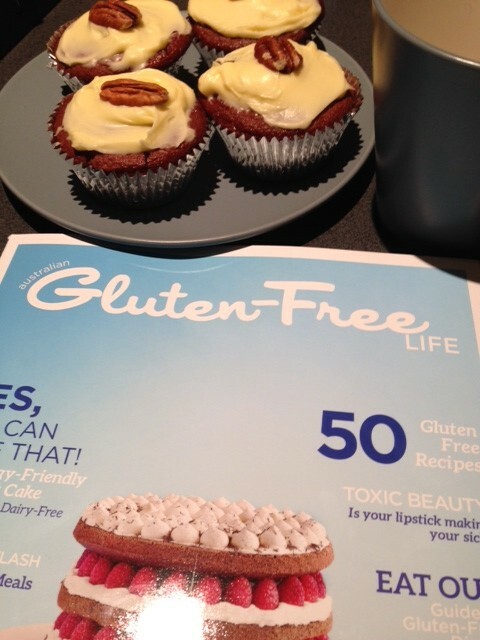 I cheated and bought a Melinda’s gluten free goodies Red Velvet cake mix and made some cupcakes with cream cheese frosting – yum! Check out Melinda’s website here. There is a new Italian Cafe Restaurant in the same premises as where Danny’s used to be. Headed out for Friday night dinner date with my husband and was impressed with the gluten free options including pasta and pizza. The staff were very helpful and checked any requests with the chef. We shared some flash fried calamari and polenta chips for entree. 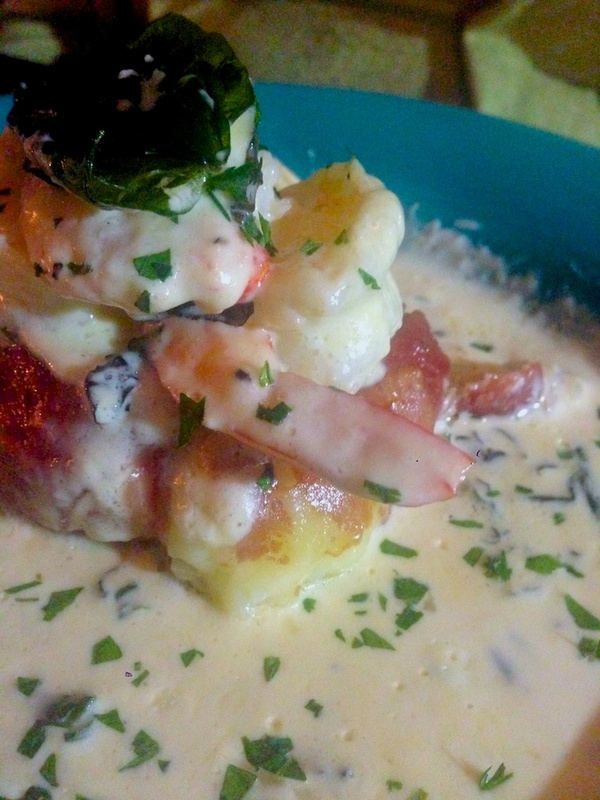 I chose a baked risotto for mains which was very tasty being wrapped in prosciutto and served with prawns in a creamy sauce. The dessert options not so great but the chef did make me an affogato. I checked with the staff and they can offer gluten free breakfasts as have gluten free bread available. Check out their Facebook page here.